On the brightly lit stage dancers in colourful costumes twist and swirl in dizzying moves. 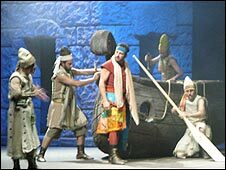 Beirut's main theatre is packed: Lebanese have come in hundreds for the premiere of a play that explores parallels between them and the Phoenicians - the ancient people who once inhabited their land. The musical called "The Rise of Phoenix" is about defying hardships and the ability of a nation to rise from its own ashes. But it is also a criticism of the lack of unity which led to the fall of the Phoenicians, and which is part of Lebanon's political reality today. "We inherited that Phoenician mentality," says Osama Rahbani, one of the creators of the play. "The Phoenicians were good businessmen, but they were selfish, they were not united. I think the main point of the play is to remind the people that we must learn from our own history," Mr Rahbani says. But in Lebanon history has always been a source of contention - even when it came to something as ancient as the country's Phoenician heritage. In the first millennium BC, Phoenicians, enterprising seafarers from the territory of the modern day Lebanon, established their trading empire. From their base, they spread across the Mediterranean founding colonies and trading posts along its shores. Described by historians as the "worlds first capitalists" the Phoenicians controlled the Mediterranean for nearly 1,000 years, until they were finally conquered by the Romans. Nabil says he would be "very proud to be a Phoenician"
Today they are among the most enigmatic of ancient civilizations, history knows very little about them and most of their legacy has long been lost. But during the civil war in Lebanon, Christians and Muslims often disputed their Phoenician roots, each claiming they were the true descendants. Now science has put this argument to rest. The genetics lab at the Lebanese American University is part of the multimillion dollar Genographic Project that uses genetics to map out human migration. "The Phoenicians were here three thousand years ago and we were not at all sure whether we would be able to find out any genetic remains of their civilization. 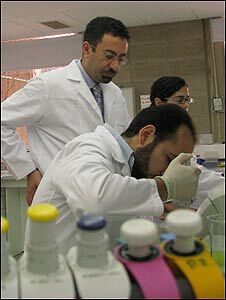 I think the fact that we did is amazing," says Dr Zalloua. Dr Zalloua and his team studied DNA data from more than 6,000 men across the Mediterranean, and used a new analytical technique to detect the genetic imprint of historical migrations. Dr Zalloua says the project's discovery is a "truly unifying message"
Dr Zalloua says in Lebanon the Phoenician signature is distributed equally among different groups and that the overall genetic make-up of the Lebanese is proving to be similar across various backgrounds. "Whether you take a Christian village in the north of Lebanon or a Muslim village in the south, the DNA make-up of its residents is likely to be identical," says Dr Zalloua. "I think it's a truly unifying message, and for me its very gratifying. Lebanon has been hammered by so many divides, and now a piece of heritage has been unravelled in this project which reminds us that maybe we should forget about differences and pay attention to our common heritage," says Dr Zalloua. Just a stroll down from Dr Zalloua's genetic lab, the Mediterranean Sea shimmers in the evening sun, its waves splashing over the ancient harbour of Byblos. Today the citadels and towers of Byblos are the monuments to Lebanon's long-lost past. It was from here that the Phoenicians sent their ships across the Mediterranean. More than three thousand years on, children play along the modern boardwalk under the citadel the Phoenicians once built. Next to them, a young couple lock in embrace and watch how the sliding sun paints the sea red. Their country, split along religious lines, war torn and politically unstable is a long way away from the unity it so desperately needs. But while the divisions and disputes may be part of life here, the common past uncovered by science is a precious reminder of just how much the Lebanese share.